C.S. Lewis Once Said "Integrity is doing the right thing, even when no one is watching." Well, this morning, I had a similar thought. It was a little dark out, and I was walking Miranda. She want into a patch of ivy and started to do the thing we came outside for in the first place. I knew it would be treacherous to go in there and pick it up, but there have been lots of emails around here lately from the leasing office about how people don't pick up their pet waste. So, I waded through the ivy, miraculously managing not to step on any other pet waste, and used a little baggy to clean up after the baby Miranda. 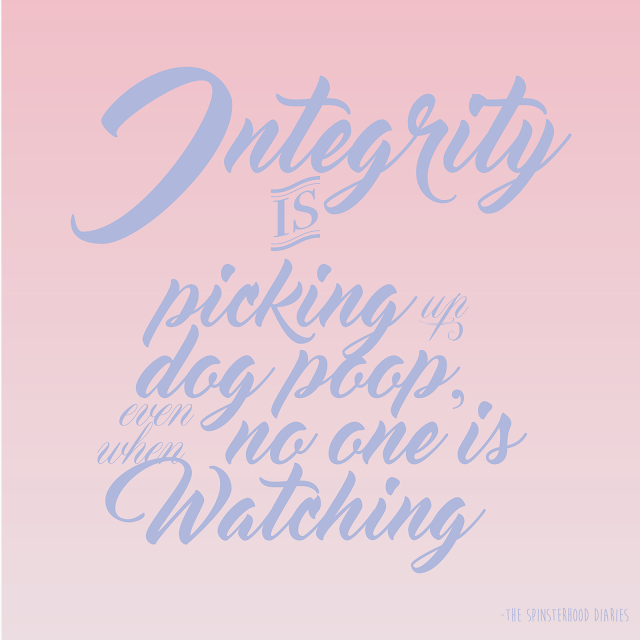 And I thought to myself "Integrity is picking up dog poop, even when no one is watching." Does this mean I have integrity? No. It means that I think some old busybody might be sitting next to their window, lights off, waiting to find someone to report. Because in my life, if everyone is getting away with something, I will be the only one who is caught. That is just the way it goes for me. So, perhaps you have more integrity than I. Either way, I'm going to continue picking up after my pet, even if it appears no one is watching.